Martha Rea Baker has been selected as one of the artists in the Miniature section of the annual gala and sale benefiting the Albuquerque Museum of Art, Albuquerque NM. Friday Premiere: The exhibit opens Friday, October 21, 6pm – 9pm. For the serious art collector, join a limited group to view and purchase the artwork in an intimate environment. Saturday Gala: A cocktail party in the exhibition gallery with the opportunity to purchase art while enjoying the lively atmosphere with friends and the artists. For her submission, Baker has created encaustic mixed media paintings from her Desert Rhythms series on 12″ x 12″ x 2″ cradled panels. Click or scroll over each paintings to view the details. 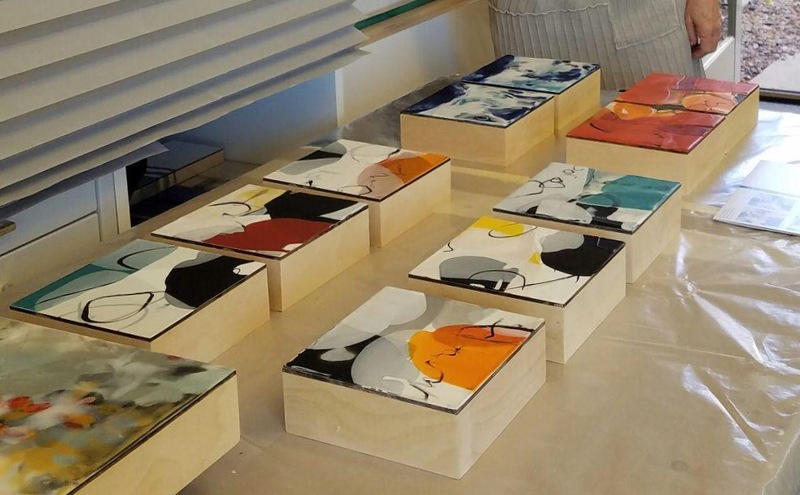 Martha Rea Baker has spent the past month working with encaustic hot wax. We have posted a few of the 6″ x 6″ x 2″ panels. Martha Rea Baker talks about her recent work for the upcoming exhibit on Canyon Road in Santa Fe, New Mexico. These encaustic hot wax paintings are part of the new series, “Desert Rhythms” inspired by Baker’s ten years of living in the American Southwest.